The transparent aligners are modern alternative of the non-aesthetic braces. A new generation of unobtrusive, removable aligners, produced from safe transparent material. The treatment lasts considerably shorter, usually 3 to six months. They will imperceptibly align the teeth, resulting in a perfect smile. Highly hygienic, easy to clean. 1. Initial check-up, where the aligners treatment and any other possible dental problems are discussed. 5. The treatment ends in 3 to 6 months, with perfectly aligned teeth without any discomfort. Who can benefit from this modern treatment? The invisible aligners are suitable for simple to advanced orthodontic cases. Besides their aesthetic value, they also tend to be more efficient when it comes to patients’ oral health. Not only do clear aligners make cleaning easy, but they offer patients the freedom to eat what they want and brush their teeth normally. Up to 3 to 6 months, only in rare cases up to 9. The patient compliance is paramount for a successful treatment. Preferably, the aligners should be worn 22 h a day, and should e removed only during meals or teeth washing. The minimum time is at least 20 h a day. Can the patent eat with the aligners? 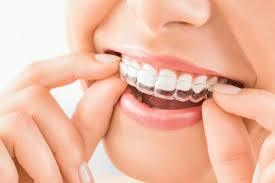 The clean aligners are removed very easily, so there is no need to. Just don’t forget to put them back on. Is there any discomfort during the treatment? The clean aligners provide a convenient and pain-free experience, There might be a weird sensation in the teeth at the beginning, in the first few days, but after that the patient gets used to it.